In the darkness, the dead dream. 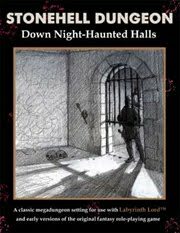 What was believed held in Death’s firm embrace rouses itself in the night-haunted halls and gloomy chambers deep under the earth. 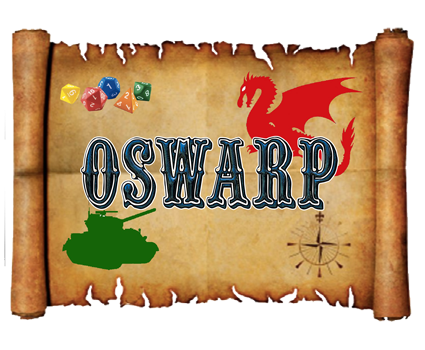 On Fourth of July weekend, I’ll be heading across the mighty Hudson River to the hinterlands of Northern New Jersey for DEXCON, specifically to take part in OSWARP (Old School Wargames and Role-Playing) mini-convention. It will be playtests galore as I bring the first two parts of The Four Phantasmagorias DCC RPG adventure series to the table, and the second playtest of my upcoming METAMORPHOSIS ALPHA adventure. Event registration is now live, so if you’re in the tri-state area and looking for some Old-School gaming (and are free Fourth of July weekend), consider coming on down. In addition to my own humble presence with DCC RPG and MA, old-school games such as D6 Star Wars, classic Traveller, Swords & Wizardry, Stars Without Number, OD&D, AD&D, Adventures Dark & Deep, Call of Cthulhu, and Champions are on tap, as are a bevy of new school games and classic wargames. I’m still hashing out the details of my weekend, but I’ll certainly be around for Thursday, Friday, and part of Saturday. 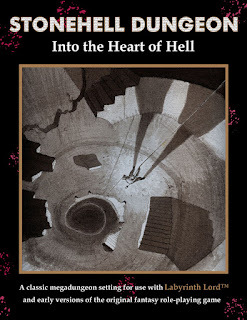 R0235: Dungeon Crawl Classics; "The First Phantasmagoria" presented by Michael Curtis. An OLD SCHOOL Game - Part of the OSWARP Mini-Convention at DEXCON 17! Strange symbols appear on you flesh and the most learned minds in the realm cannot fathom why. Perhaps those eldritch priests who serve the Great Dreaming God, Cthulhu, can help decipher them. What could possibly go wrong there? "The First Phantasmagoria" is the beginning adventure in a multi-part adventure saga from Goodman Games. Thursday, 8:00PM - 12:00AM; One Round; All Materials Provided. Beginners Welcome; Fun, All Ages. R0269: METAMORPHOSIS ALPHA (1976); "Level of the Lost" presented by Michael Curtis. An OLD SCHOOL Game - Part of the OSWARP Mini-Convention at DEXCON 17! A formerly sealed section of the Warden has been opened and rumor has it that one of the fable command rings awaits beyond the entrance. Does your band of explorers have what it takes to overcome the hazards of the Level of the Lost and emerge with this potent artifact? This adventure is highly dangerous, but highly fun! Friday, 2:00PM - 6:00PM; One Round; All Materials Provided. Beginners Welcome; Fun, All Ages. R0288: Dungeon Crawl Classics; "The Second Phantasmagoria" presented by Michael Curtis. An OLD SCHOOL Game - Part of the OSWARP Mini-Convention at DEXCON 17! Venture back to the Drowse to enter the Forest of Childish Delights. Inside lies another part of your quest for the Four Phantasmagorias. But things (and people) turn weird once they cross the verge of the woods, so be forewarned. This may make overcoming the eclectic collection of enemies birthed from bloodstained fairy tales a tad difficult to overcome. "The Second Phantasmagoria" is the second adventure in a multi-part adventure saga from Goodman Games. Friday, 8:00PM - 12:00AM; One Round; All Materials Provided. Beginners Welcome; Fun, All Ages. Hope to see some familiar faces (I know I will just looking at the folks who are running games) and to meet new gamers. Feel free to bring stuff for me to deface if you want my scrawl on something. Depending on my final schedule, I may actually play something this time around, too. 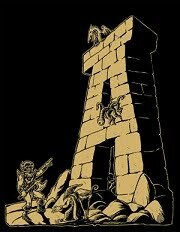 There is a Kickstarter currently underway for my forthcoming DCC RPG adventure DCC #83 The Chained Coffin. Why is Goodman Games conducting a Kickstarter rather than simply publishing the adventure as they’ve done eighty-two times before? Good question. It began with a little puzzle lock idea I included in the original manuscript. An ancient and long-sealed door bears a combination lock puzzle that needs bypassing in order to get through the mighty valve. 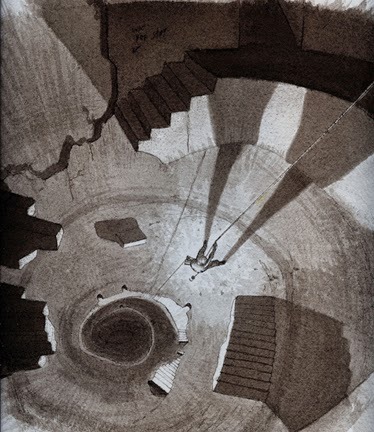 My initial plan was to have the puzzle illustrated in three pictures that could be printed out or photocopied, and then the judge would assemble the wheel by hand to give to the players to monkey with. Joseph Goodman thought we could go one better and inquired with the printers whether it was possible to create such an item and have it included with the adventure. It was, but it would take a little doing, and thus the Chained Coffin Kickstarter campaign was launched. That was the humble beginning of a project that is now dreaming big dreams and asking the DCC fans for help achieving that objective. Joseph and I discussed various stretch goals to help drive the Kickstarter, and I admitted that I had a lot of stories waiting to be told in the Shudder Mountains, that fantasy Appalachia analog inspired by the works of Appendix N author, Manly Wade Wellman. I originally told Joseph that if the adventure proved popular, I’d like to revisit the setting again in a sequel. If all goes well, I might not have to wait that long. It has come to pass that The Chained Coffin may be destined for greater things that a simple 32 pp. adventure. If the fans desire it, The Chained Coffin could become a mini-campaign boxed set, one that includes a large 11”x17” regional map, a gazetteer describing the Shudder Mountains, and, in addition to The Chained Coffin adventure, a pair of secondary adventures designed to begin play in the region as zero-level PCs and to encounter later in their adventuring careers. Needless to say, if this “campaign in a box” idea becomes a reality and is well-received by the fans, it may begin a new trend with DCC RPG. People have been clamoring for an official DCC RPG campaign world (whether a new one or a revised version of Aereth, Goodman’s original campaign world for the 3E DCC adventures) and this could be the first of several steps to make that happen. DCC RPG encourages judges to abandon the notion that the campaign world needs to be a vast, sprawling expanse filled with countless cities and diverse ecospheres. Instead, DCC RPG suggests taking a smaller approach and limiting the campaign to a compact region, like a duchy, a minor stretch of wilderness, or even a single valley. The Shudder Mountains are precisely this style of world design: a finite area filled with enough adventuring ideas, unusual locals, and unique critters to meet the needs of long-term play. A series of “campaign boxes” would allow judges to pick and choose what they want to include in their campaign worlds, rather than be given the full world treatment common to most pre-packaged fantasy campaigns. To continue with an Appalachian-themed metaphor, you’d get the patches to make the quilt rather than the whole blanket, and could assemble them using only the squares of color that catch your interest. Not into Egyptian-themed adventuring regions? Then there’s no need to spend the buy that campaign module (although if I wrote that one, I hope you would anyway). Love the idea of sword-and-planet type adventures? Pick up the hypothetical “Perils of the Purple Planet” themed set. And so on down the line. This way, the folks who want a sense of a shared campaign world could have one—if they so desired—while the maniacal homebrewed campaign designer could pick and choose, utilizing material from the sets that captured their interest whole cloth or just the portions they liked. It’s an interesting concept and I believe it would be useful to game masters of not just DCC RPG, but other fantasy games as well. 1) DCC RPG #83 The Chained Coffin with a special silver foil cover. 2) A stand-alone spinning wheel puzzle dial along with five other ways to utilize the device in your campaign beyond the original door lock. 3) Additional source material including a patron write-up for “Ol’ Blackcloak,” a powerful entity encountered in the adventure. 4) A mini-gazetteer of the Shudder Mountains region. 5) Several pages of added random encounters in the Shudder Mountains. 6) Two full pages of Doug Kovacs’ illustrated player handouts. 7) Seven alternate versions of the Bad Lick Beast, another challenging denizen of the Shudder Mountains. 8) Two more pages of player handouts. 9) A zero-level adventure complete with Shudder Mountain regional starting occupations. 10) The Almanac of the Shudder Mountains (working title) that compiles the additional background material into a single, digest-sized supplement for ease of reference during play. The Almanac includes several new monsters waiting to meet the players. 11) $18,000: The Almanac will be expanded to include Magic of the Shudder Mountains. 12) $20,000: The Almanac will be upgraded to 24 pages of normal letter-sized pages, and will be expanded to include even more gazetteer material. 13) $25,000: We'll add in another mini-adventure in the Shudder Mountains that fills the gap between your level 0 characters and the level 5 Chained Coffin module. 14) $30,000: The Almanac will be expanded with another 8 pages of gazetteer material further expanding the Shudder Mountain region. 15) $35,000: We'll print an 11"x17" poster map of the Shudder Mountains region. 16) $36,000: We'll print a full-color box to hold it all! The Shudder Mountains gazetteer and adventure path will be complete. This two-part box (i.e., complete with "box and lid," both in color) will hold your copy of the module, the Almanac, the poster map, and the bonus mini-adventure. With some room to spare! One of the great joys of writing DCC RPG adventures comes from the game’s commitment to remaining true to the classic pulp-era fantasy and science-fiction stories that inspired fantasy roleplaying, the so-called “Appendix N” tales. And while “sword & sorcery” yarns comprise the lion’s share of Appendix N, they are not the only types of stories found within it. The Chained Coffin derives its inspiration from American folklore, as perceived through the atmospheric works of Manly Wade Wellman. You’ll find no kobolds and orcs in The Chained Coffin, but plenty of restless ghosts, shunned witches and conjure-men, and devils willing to make a deal at midnight, all set against a backdrop of superstition-filled mountains and secluded hollows where the still air smells of pine trees. Heady stuff, indeed, and a far cry from your traditional fantasy RPG fare. Thanks, friends. See you in the Shudders. 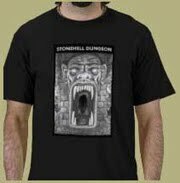 I've been keeping the masses informed about the progress of the Stonehell Dungeon sequel over on the books' Facebook and Google+ pages, but new milestones have been reached. I thought I'd share that report here, along with a preview of the cover art and links to other associated projects. I’m extremely pleased to break the month-long silence with news that all the last elements of the book are coming together. As predicted, I didn’t have much to report as the book’s progress relied on other people’s contributions and wasn’t directly in my hands. It amazing how things move forward when I’m not the one responsible for pushing the project along. This report brings us two big pieces of news: the finalization of the sequel’s cover art and the edited manuscript back in hand. J.A. 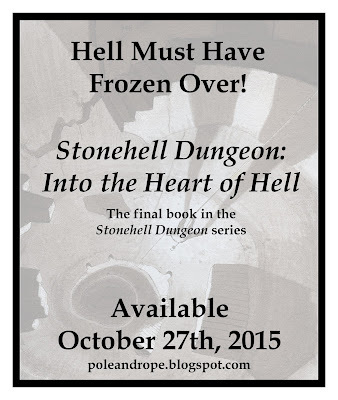 D’Andrea, who did the cover of the first Stonehell book, is providing the cover art for the sequel. I’m always greatly impressed by J.A.’s work, but his piece for the sequel really struck a chord. He did a magnificent job of expressing the depths of Stonehell Dungeon and the strange mentality that accompanies those who tread its halls. I’m proud to feature this one on the cover, not only because it’s good, but because having J.A.’s work reappear makes a nice book-end for the Stonehell series. Other pieces of art are also trickling in, meaning that I’ll soon have all the components needed to push on to final layout. I have also received the edited manuscript back from the outside editor. I’m happy to report that my own three passes over the draft were not in vain and that the editor found only minor corrections that need to be implemented. This was a great relief, as my mind always suspects the worse when I send things off for others to review. However, in this case at least, the worry was unfounded. 1) Implement the minor changes required by the manuscript. 2) Collect the last stray pieces of art. 3) Finalize the layout by adding the art, tweaking the format, and including the various legalese, index, credits, and “special thanks to” sections. 5) Get a printer’s proof made and review it. 6) Make any final changes required by the proof. As you can see, there’s still a little work to be done, but we’re heading into the last mile of the journey. Unfortunately, and you knew there had to be an “unfortunately” if you’ve been following this project, I’m running into a time crunch. The success of the Metamorphosis Alpha Kickstarter left me with a few pressing projects that need completion ASAP. I need to get these off my plate before I can attend to the sequel. I also have North Texas RPG Con in a month and must complete the last adventure that needs writing before I get on the plane for Dallas (space remains in at least two of my games if you’re interested). I’d hoped to be able to debut Stonehell 2 at North Texas, but, barring a miracle of time and effort, I doubt this will occur. 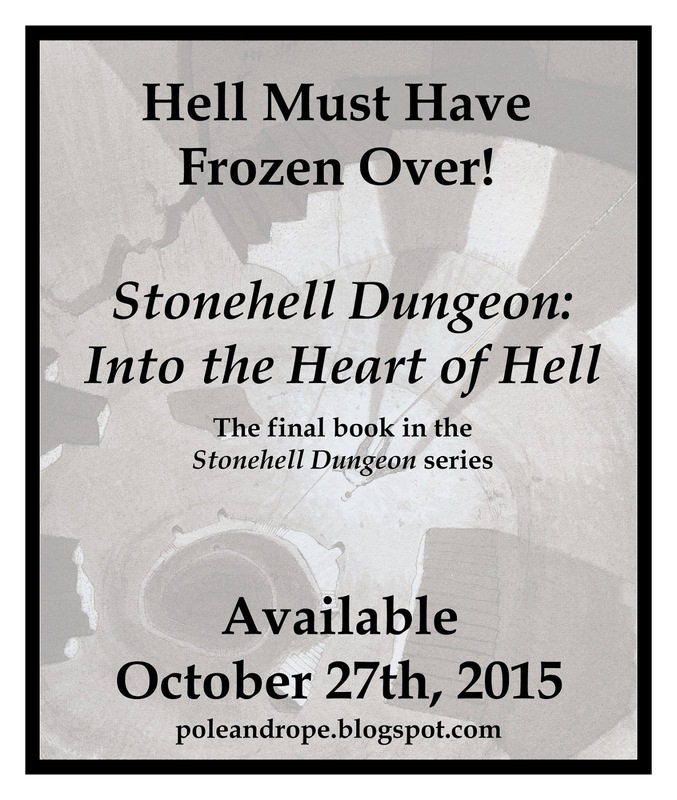 Rest assured, I’m eager to complete Stonehell 2 and bid a fond farewell to the project. I’ll continue to push ahead when I can and I’ll keep you informed of my progress. Once again, I thank you for your patience, but know that we’re almost there. 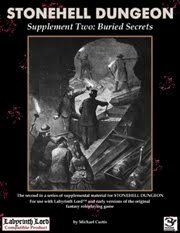 In the meantime, I ask anyone who enjoys my work to check out the latest Goodman Games’ Kickstarter for The Chained Coffin, a new adventure penned by me that centers on a hexcrawl through a “fantasy Appalachia” as inspired by the work of Manly Wade Wellman. 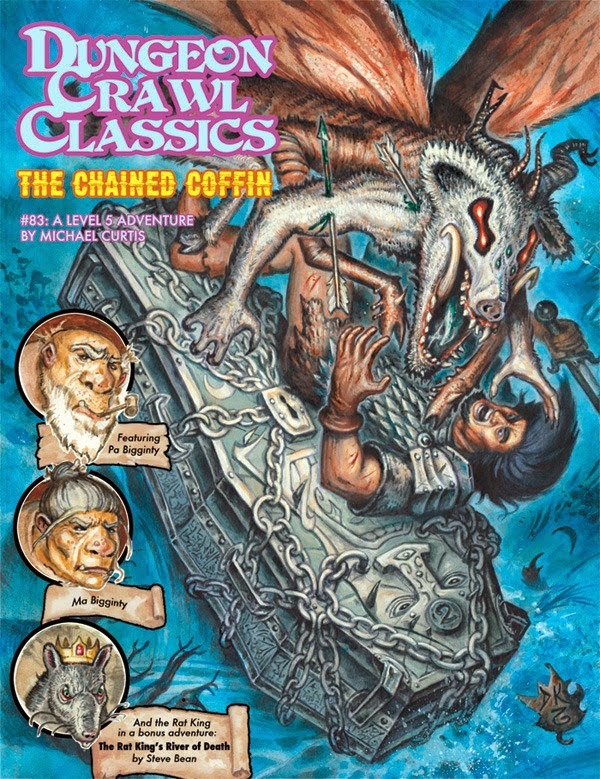 The Chained Coffin is one of my favorite works to date and I think it demonstrates admirably the goal of DCC RPG going back to the source material of the hobby and doing new and interesting things with the Appendix N material. You may have heard the news already, but I’ve yet to chime in on the latest announcement by Goodman Games that emerged from the chaos of Gary Con VI. Yes, it’s true: the original METAMORPHOSIS ALPHA rules as written by James. M. Ward is being re-released in a deluxe collector’s edition! Late last year, I started receiving some very cryptic emails from Joseph Goodman inquiring about my familiarity with METAMORPHOSIS ALPHA. I knew the game, and had the uncommon honor of adventuring aboard the Warden three times under Jim Ward’s mastery without the loss of life or limb. I was hoping these email were leading in the direction they seemed to be going, and, sure enough, once the legalities and contracts were obtained, I got the invite to climb aboard the doomed Warden for another go-around. For those of you unfamiliar with METAMORPHOSIS ALPHA, it is the original science-fiction roleplaying game released by TSR back in 1976. You play the role of a primitive tribesman aboard the generational starship, the Warden, bound for a distant star. Generations ago, catastrophe struck the Warden, killing a large percentage of the crew and colonists, and mutating many of the survivors. Over time, those left alive on the Warden forgot their original mission and plunged into a state of barbarism. The decline of civilization was so thorough that the survivors forgot they were aboard a starship, and developed tribal communities in self-contained levels of the ship that defined their entire world. As a player character, you begin the game in these small enclosed worlds but eventually discover the truth of your predicament, acquiring knowledge of the Warden and learning to use many of the weird artifacts (lasers, vibro blades, Geiger counters, etc.) left behind by the original crew. If you survive long enough (a difficult task given the hostility of the mutated creatures that prowl the ship and the lethality of radiation still lingering in places), you may eventually gain control of the ship and perhaps even guide it to safety on a new world. Although METAMORPHOSIS ALPHA didn’t have a long printing life during the TSR days, the game, unlike the PCs who explore the Warden, proved notoriously hard to kill. 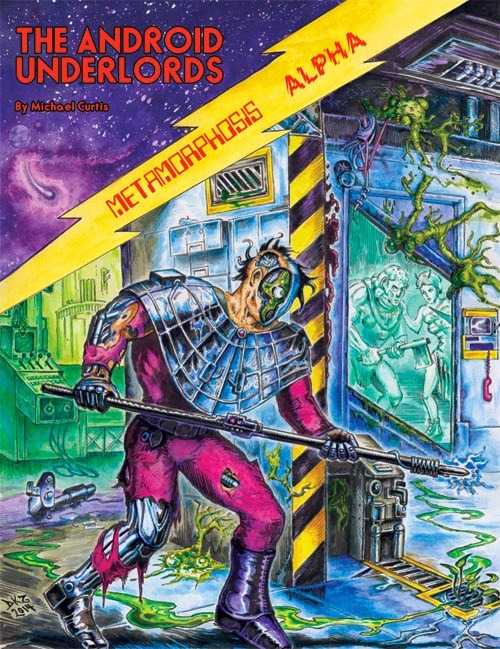 METAMORPHOSIS ALPHA is the urtext for GAMMA WORLD, and many of the mutations, mutants, and technology found in that first post-apocalyptic roleplaying game first appeared in MA. And like GAMMA WORLD, a game which has gone through seven or eight editions, METAMORPHOSIS ALPHA endured beyond its original print run. TSR released a version of the game for it AMAZING ENGINE system in 1994, Fast Forward Entertainment published a 25th anniversary edition in 2002, Mudpuppy Games produced the fourth edition in 2006, and there is currently work on a 5th edition of MA by Signal Fire Games. On top of all this, the original 1976 rulebook is available for download and print-on-demand from WardCo. “So why in the blazes in Goodman Games producing a deluxe collector’s edition of the original rules?” you might ask. The answer is based on playability, longevity, and historical importance. The original rules, as available from WardCo., are identical to the 1976 TSR release—and that includes the minute font they were printed in. If you’ve never seen the original rulebook, the type is very small and the layout is in dual column format. That might have been a good idea in 1976, but as many gamers get older, their eyes aren’t what they used to be and the tiny type becomes difficult to decipher. The Goodman Games print run will be an oversized 10.5” x 14” book, allowing the original rules to be printed at 110% size. This will alleviate the eyestrain factor. The Goodman Games version also collects a vast amount of material released for METAMORPHOSIS ALPHA under a single cover. Magazine articles about the game, James M. Ward’s short story, “Footprints in the Sky,” a new introductory adventure, special advice essays written especially for the deluxe edition, and other useful material will all be compiled in the Goodman Games edition. To ensure this material survives, say exposure to cosmic radiation (or regular game use), the deluxe edition will utilized high-quality binding, that used by collegiate text, to keep the book intact for decades to come. It’s a book you’ll be proud to have as part of your RPG collection, yet tough enough to actually use at the table. 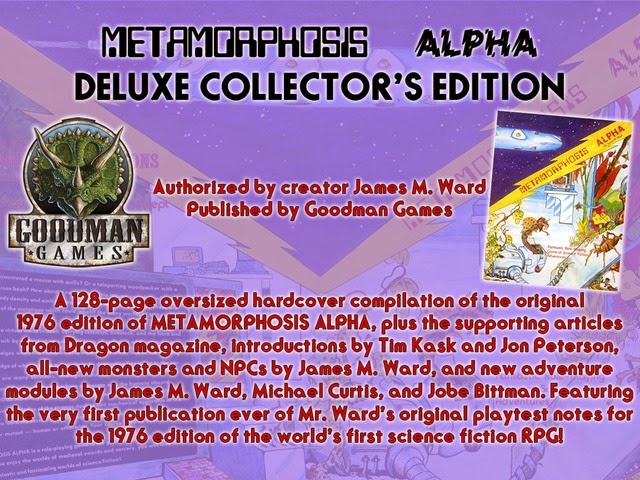 The collector’s edition release also allows Goodman Games to provide support for METAMORPHOSIS ALPHA in the form of published adventures, something that MA has been lacking for many years. Four (and maybe five if the Kickstarter hits its stretch goals) adventures released by Goodman Games are planned for METAMORPHOSIS ALPHA in the coming year. The first, The Android Underlords, was available for purchase at Gary Con VI and was written by yours truly. The opportunity to contribute even a little bit to the Warden’s long history was a dream come true for me, and when the creator of the game praised the adventure, it was a fan’s dream come true. If Jim likes it, you know it’s both good and worthy of bearing the METAMORPHOSIS ALPHA title on the cover. Once the Kickstarter funds, there will be another three adventures produced, one by Jobe Bittman, another by me, and a third by the captain of the Warden, himself, James M. Ward. Should the Kickstarter hit $37,000, a fifth adventure, author to be determined, will be published as well. Even if you decide that the collector’s edition isn’t your cup of tea, you might consider contributing to the Kickstarter to get the complete run of adventures, all of which can be played with the WardCo version of the rules or easily adapted to other RPG systems (like DCC RPG, for instance!). Before I go, it bears mentioning that the deluxe collector’s edition is being produced under a license that allows a single printing of the book. Once this run is gone, so is the deluxe version. Those who don’t get aboard the Kickstarter now will have to rely on the secondary markets—where it will command an extravagant price—to obtain a copy.